Summer vacation could never been busier. After graduation means time to hang out and catch up with everyone before leaving and getting visa for university done. I went out a lot for visa applications, university advising things, going back to Jakarta and covering korean events in Singapore. Going out everyday with hardly rest means make up to cover up and enhancing anything else. These are some products I’ve been using so often this past month and a half. Diorshow waterproof in 90 was something I picked this up on my way to Jakarta. I needed new mascaras since I finished up my 2 maybelline ones. Although it is waterproof, this isn’t difficult to remove at the end of the day, unlike most waterproof products. I didn’t have to use an oil based make up remover and this does not smudge on me nor does it clump. The maybelline falsies volum express waterproof mascara was something I purchased during a fair in the Singapore expo held by courts. It was on sale, half price the usual price when bought in stores like Watson. My drugstore alternative to the Dior one and I don’t mid finishing it up as soon as the Dior mascara. Base make up is really important this time since my skin condition is quite bad due to the haze. 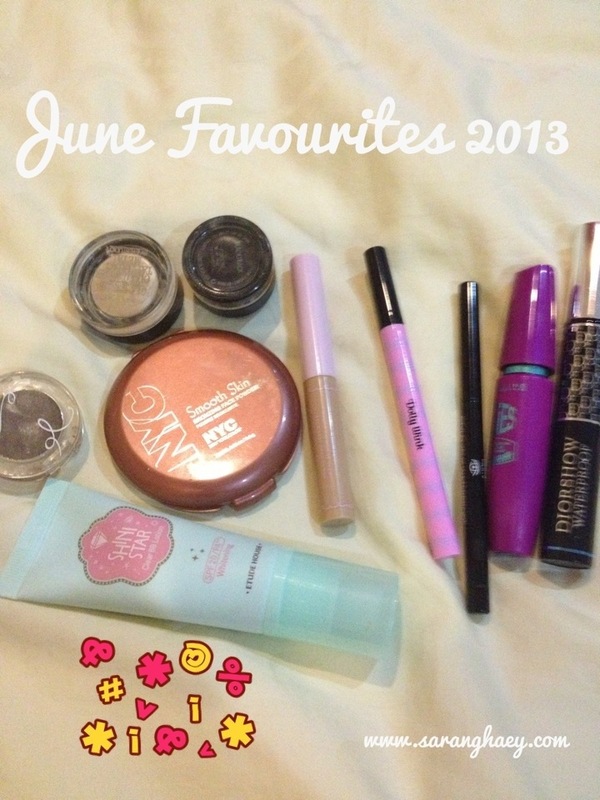 I’ve been using 2 Etude House products, the Shini Star Clear BB lotion and the Surprise Stick Concealer. I didn’t need a whole lot of concealment since it was just redness and some hormonal acne. The Shini star bb lotion was light enough for everyday usage without feeling heavy in the summer time and covers my redness, I loved it so much this is my 2nd bottle and I have another back up. But if you need more coverage in Bb cream or foundation, don’t take this. The surprise stick concealer is a cheaper and more light weight but full coverage concealer as compared one of my body shop concealer, which was too creamy. NYC Bronzing powder in Sunny. My first non shimmery, drugstore bronzer. Really can’t go wrong with this since its not too shimmery. Travelling means bring light. The size as compared to my Urband Decay bronzed is smaller and it has a mirror built in.